Wednesday, March 25, 2015, 6:30 p.m. 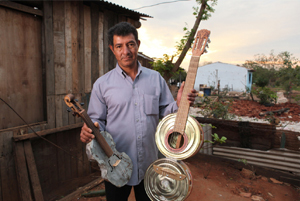 LANDFILL HARMONIC Children from a Paraguayan slum play instruments constructed from garbage in their "Recycled Orchestra." This beautiful story weaves together the transformative power of music, poverty, and waste pollution into a precautionary, yet hopeful tale. Landfill Harmonic follows the orchestra as it shares the inspiring spectacle of trash-into-music around the world, sharing harmonies and realities of the billion tons of garbage produced every year and the lives of those who must live alongside the world's trash. Directed by Brad Allgood and Graham Townsley. Produced and co-directed by Juliana Penaranda-Loftus. Executive Producer, Alejandra Amarilla. Co-producer, Jorge Maldonado. A discussion with all five filmmakers, moderated by JD Talasek, Director, Cultural Programs of the National Academy of Sciences, follows the screening. A saxophone and a violin from the Recycled Orchestra will be on display.